Rare 1895 baby names make for a curious list. Were we really naming our sons Montie, Mayo, and Vester? Were girls called Clifford and boys named Martha – or were thob typos somewhere along the way? Did we really use Wm and Geo as boys’ names, or were they common abbreviations that made their way into the dataset? I’d bet money on the latter – but I don’t absolutely know. 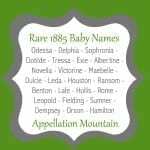 My guess is that many of the rare 1895 baby names will remain just that – rarities – even though many would fit in beautifully today. This list includes one name that I’m watching closely, and a few others that I’m surprised don’t rank in the current US Top 1000. They ranked #500 or higher in 1895. They’ve never cracked the US Top 100. Most of the names on this list are not in the current US Top 1000. As I wrote in the first post in this series, it’s possible that many of these names are headed for obscurity. Because they were never common, it’s less likely that we’ll find them on our family trees, or spot the name in the historical record. They’re the opposite of favorites from the early 1900s, like Dorothy and Arthur – names that we’ve never really forgotten, even if they were briefly out of vogue for our children. 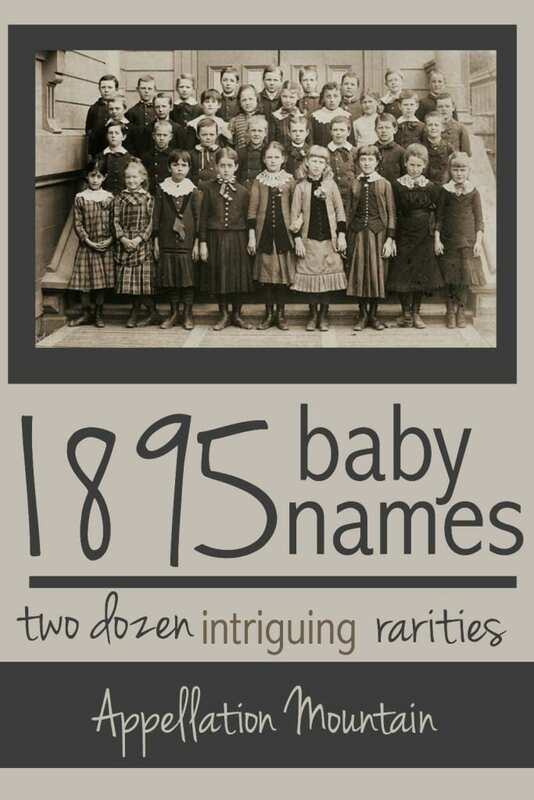 Read on for two dozen of my favorites finds from rare 1895 baby names. Dinah – Someone’s in the kitchen with Dinah! Or so goes the lyric from the 1894 song “I’ve Been Working on the Railroad.” This Old Testament name hugged the fringes of the US Top 1000 in the nineteenth century, and was even more popular from the 1940s through the 1960s. Credit to the lovely Dinah Shore, who recorded more than eighty hits in those years, and also made appearances on movies and in television. But doesn’t Dinah feel like the kind of name that ought to be back in 2016? A little bit Nora, a little bit Leah. Just 53 girls were given the name in 2014. Thora – Speaking of names that ought to work in 2016, Thora is another. It sounds like the rising Cora and favorite Nora, but it has different roots. Thora comes from the Old Norse Thor, and Thora also appears as the wife of Viking king Ragnar Lodbrok in legends. If Thea is on the rise, why not Thora? It was on the fringes of the US Top 1000 from the nineteenth century into the 1920s, but just 20 girls were given the name in 2014. Genoveva – Torn between Genevieve and Isabella? Borrow the best of both with this Spanish form of Genevieve. Genoveva appeared in the US Top 1000 just three times: 1885, 1894, and 1895. But it’s a great name for a girl today, with the repeating V sounds and the potential nickname Evie. Genoveva is also operatic, thanks to Robert Schumann’s opera by the same name, based on a medieval legend. The name is romantic, elaborate – and perfectly wearable. But it’s definitely among the rarities on this list of 1895 baby names. It was given to just 12 girls in 2014. Nevada – We love place names for our children. Think Camden, London, Brooklyn, and Savannah. So why not Nevada? Just like Odessa made the rare 1885 baby names list, Nevada belongs on this one. There are simply some place names that we stopped using along the way – Missouri was also in the Top 1000 during in 1895! But it’s Nevada that feels especially wearable now. As with Genoveva, it’s the ‘v’ sound of Ava and Evelyn that makes this name so compelling. 22 girls and 7 boys were given the name in 2014. Blossom – I’m intriguing by the idea of pan-botanical baby names like Petal and Fleur. Blossom belongs on this list. While it’s easy to dismiss Blossom as a daffy 1990s sitcom name never intended for a real girl, jazz singer Blossom Dearie was successful in the 1950s and beyond – and yes, it was her birth name. Blossom appeared in the US Top 1000 as early as 1882 and as late as 1931. It’s a great find among the rare baby names of 1895. 36 girls were given the name in 2014. 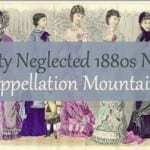 Delphine – Delphia and Victorine made the 1885 list, so why not Delphine? It’s as delicate and French as Vivienne, and as tied to the natural world as Daphne. While it comes from the ancient place name Delphi, it’s associated with the Latin word for dolphin. In English, delphine is the equivalent of canine or feline. Delphine ranked in the US Top 1000 in 1895, and continued to chart in the US through the 1960s. Today it’s rare – just 34 girls were named Delphine in 2014. Leontine – Don’t you love a good Leo name? There are some lovely, rare Leo names for girls, including Leontine. French in origin, it occasionally ranked in the US Top 1000 in the late nineteenth century through 1907. Leopold made the list of rare 1885 baby names, so it seemed like a girls’ name belonged on the 1895 roster. While Leona feels vintage, Leontine is fierce – more like a name invented in 2016 rather than borrowed from the rarities of years gone by. Sibyl and Sybil – I’ve been watching Sybil closely, convinced that Downton Abbey will – even though it’s recently left the air – finally launch the name of the youngest Crawley daughter. Harry Potter couldn’t do it – though JK Rowling’s Sybill Trewlaney wasn’t quite the kind of character that inspires parents. The ancient name means prophetess, and the Sybil spelling has been more popular in the US, most years. In fact, the name in general was more popular most years, ranking in the Top 1000 through the 1960s. It’s tailored but feminine, and feels modern – but clearly has roots that stretch back through millennia. Zelda – Zelda was my last minute entry to this list of Happy Names for Girls, though there’s more than one explanation for Zelda’s origins. Back in 1895, Zelda was a gently rising choice for girls. While it was never very popular, Zelda remained on the fringes into the 1960s. By the end of the decade, it was a name exotic enough to be used for Sabrina’s Aunt Zelda in comic book Sabrina the Teenage Witch. Today, Zelda is trending, with 212 girls given the name in 2014. Petra – I think Petra fits right in with Cora and Piper, but these days, it’s more like Dinah. Petra can be a feminine form of Peter, and it’s also an ancient place name. As of 2014, a mere 143 girls were given the name, which is fairly uncommon. But from the 1880s through the 1960s, Petra hugged the fringes of the US Top 1000. Paralee – While many of the names on this list could easily make a comeback in 2016, I think Paralee might be lost to the sands of time. Between 1880 and 1908, Paralee often appeared in the US Top 1000. My theory is that Paralee evolved from a term in a card game that mean promises. William Faulkner used the name for a character; James Agee and Walker Evans used it as a pseudonym for one of their subjects in Let Us Now Praise Famous Men. It’s a fascinating find, but one that has just about disappeared since the 1960s. Aida – Is Aida a respelling of Ada? Or is it a nod to Verdi’s 1871 opera, where it’s the name of a princess held captive in Egypt? I assume it’s the latter, if only because the story of a virtuous princess seems likely to have captured the imagination of parents. It was performed in the US as early as 1873, which seems like the right timing for the name’s popularity in 1895. Aida remained on the fringes of the US Top 1000 into the 1970s. As of 2014, the name was given to 153 girls. That makes it one of the rare 1895 baby names that’s not quite forgotten today. Casimir – I’m always fascinated by names that are widely used in European languages, but never quite made it into English in significant numbers. Forms of Casimir are used in Italian, Spanish, and most Slavic languages, but in English? Not so much. Casimir belongs with the rare 1895 baby names because that’s the first year the name ever ranked in the US Top 1000 – but not the last! Casimir remained on the edges of the US Top 1000 into the 1930s. It was given to just 30 boys in 2014, but with nicknames Cam, Cash, and Cas, doesn’t Casimir seem wearable? It fits with names like Sebastian and Alexander, both very popular today. Royce – One-part luxury automobile, two-parts short name for boys, Royce feels like an on-trend pick today. It’s also the name that made me break my rule about not including picks from the current US Top 1000 – Royce has recently pulled into the current US Top 500, and I expect it to keep climbing. But that’s part of why I wanted to include it on this list of 1895 baby names – it’s proof that plenty of modern-feeling choices are actually as vintage as they common. Guthrie – If Riley and Crosby are on-trend picks, why not Guthrie. It’s a little gruff, and a little folksy (think Arlo Guthrie and Woody Guthrie). Back in 1895, Guthrie appeared in the US Top 1000 for the one and only time – ever! And yet, it’s a great Scottish heritage pick that’s not completely forgotten – 13 boys were given the name in 2014. Evander – Despite appearances, Evander is not an Evan-Alexander smoosh. Instead, it’s another ancient name – and another name that only ever charted in 1895. It’s said that the ancient Evander of Pallene brought Greek culture, including writing and laws, to Rome some decades prior to the city’s founding. The name has been used periodically ever since, most recently for boxing champ Evander Holyfield. 92 boys were given the name in 2014. Ignatius – While we’re talking ancient names, how about fiery Ignatius? The name was originally spelled with an E, but was altered to resemble the Latin word ignis – fire. Saint Ignatius of Loyola makes this a famous saint’s name, and has kept it in use over the centuries. From 1895 through the 1930s, Ignatius hugged the edges of the US Top 1000. It’s been rare since. Just 40 boys were given the name in 2014. Giles – We’re mad for Miles, but the rhyming name Giles has been overlooked. Maybe that’s because it lacks a famous bearer, like jazz musician Miles Davis. Or maybe it’s just waiting for discovery. Giles comes from the Late Latin Aegidius. Thanks to an eighth century saint, it spread throughout Europe, becoming Egidio in Italian, Gilles in French, and Giles in English. Saint Giles is one of the churches mentioned in the famous nursery rhyme that begins, “Oranges and lemons.” A dozen boys were given the name in 2014, making this one of the rare 1895 baby names – and a rarity today, too. Larkin – Larkin could easily go to the girls, thanks to avian name Lark. In fact, it was given to 36 boys in 2014 – and 85 girls. But Larkin is originally a nickname for Lawrence, or possibly an alternate form of Lorcan. Larkin appeared in the US Top 1000 for boys many years in the nineteenth century, but disappeared early in the twentieth. Today, it could be a substitute for Landon or even Lawson. Walton – Now we come to my favorite of the rare 1895 baby names, and one that I’ve long considered for a son. Walton has all the gentleness of the 1970s television series The Waltons, but a very current sound, thanks to Mason and dozens of other -on ending names for boys. (It’s also my favorite way to update family name Walter.) From the nineteenth century through the 1950s, Walton was sometimes used for boys. Today? It’s nearly forgotten, though a handful of figures bear the name, like actor Walton Goggins. Just 22 boys were named Walton in 2014. Palmer – Here’s another of the neglected names that would fit right in today. If Parker is a favorite for boys, how ’bout Palmer? The surname was originally given to those who made pilgrimages, bringing back palm branches as a souvenir of their journey. Like many of the rare 1895 baby names go, this one was in steady use through the 1940s, before it started to fade – and despite our affection for surname names, it’s never quite recovered. If anything, it might be following Piper into greater use for girls. In 2014, 110 boys and 173 girls were named Palmer. Hurley – Harley and Huxley are cool, edgy surname names today. How about Hurley, one of the rare 1895 baby names that feels pitch perfect in the twenty-first century? Hurley is most famous as a surfboard company turned clothing line. There’s also Lost’s Hugo “Hurley” Reyes. A mere 19 boys were given the name in 2014, which seems surprising, given the success of similar H surname names in recent years. Jennings – How about Jennings? It’s preppy, and the -ings ending is highly unusual for a given name. The surname originally comes from John, and was briefly very popular in 1896 and 1897, reaching the US Top 300, likely due to populist presidential candidate William Jennings Bryan. 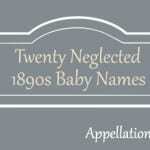 The name debuted in the US Top 1000 in 1895, making it one of the rare 1895 baby names. Eben – If Eben didn’t exist, we would have made it up and it would be right up there with Jayden and Colton. But Eben comes from the same roots as Ebenezer – as in Scrooge! 1895 was the last year Eben ever cracked the US Top 1000, and just 64 boys were given the name in 2014. You’ll find Ebens in the historical record aplenty, but relatively few on the playgrounds today. 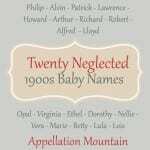 What are your favorite rare 1895 baby names? Would you consider any of these for a child today? Eben is my father’s middle name – born in 1950. He told me it means rock. This is the first time I’ve ever seen it mentioned. I like Zelda, Petra, and Evander, although many of the others are names I’d be happy to hear more of, I just wouldn’t use them myself. I know a small Giles! I could definitely see it making a small comeback, though right now it seems somewhat stuffier than the more popular Miles. Abby, it’s spooky how often I’ll be researching a name, hop on over here, and it’s mentioned/covered. I was literally just looking into Vester (the name of a friend’s pet!) It’s the European diminutive for Sylvester which makes it kind of appealing and *almost* worth overlooking the Uncle Fester jokes. Interesting about Vester – that makes sense, and it suggests that yes, we WERE naming our sons Vester in 1895. (Or they were reporting their names as Vester when they registered themselves years later …) Either way, Vester definitely qualifies as an almost lost name in the US, doesn’t it?! Some beautiful names on here, I’m loving these throwback posts! My faves are Dinah, Thora, Zelda, Leontine, Casimir, Ignatius (wish I were brave enough for this one! ), Larkin and Eben. Curious as to which one you’re watching…?! No clues?